Intel had a few updates about its Android SoC strategy for us at MWC this week. The first is a spec revision. The Atom Z2460 we talked about in great detail at CES was originally specced to run at a max of 1.3GHz but it could burst up to 1.6GHz if the thermal conditions allowed it (ala turbo boost). Z2460 yields on Intel's 32nm LP process are apparently better than expected so the Atom core will be able to turbo up to 2.0GHz instead of 1.6GHz. The default max frequency remains unchanged at 1.3GHz. Next, Intel announced two new Atom SoCs for the smartphone market: the Z2580 and the Z2000. The Z2580 is a higher end part, back from the fab now but shipping in devices in the first half of next year. It features the same architecture as the Atom Z2460 but instead of a single Saltwell core it has two, with Hyper Threading enabled (2 cores, 4 threads). The CPU cores can burst at up to 1.8GHz, while the default max CPU frequency remains at 1.3GHz. The CPU isn't the only part of the SoC to get an upgrade: Intel equipped the Z2580 with a PowerVR SGX 544MP2 GPU running at 533MHz. The SGX 544 is similar to the 543 used in Apple's A5, however it adds support for Direct3D 9_3. At 533MHz you can expect roughly twice the shader/compute performance of the 543MP2 that's in the A5. Granted by early next year we'll likely see competitive, if not faster GPUs implemented in SoCs (quite possibly long before then). The Z2580 also received upgrades on the modem interface side to cope with the increased bandwidth from the LTE baseband. Remember the Z2460 launched with a HSPA+ baseband pair (XMM6260). Just like with the Z2460, Intel has produced a FFRD (Form Factor Reference Design) based around the Z2580/XMM7160. I don't have photos (nor have I seen) the new high-end FFRD, but I'm told it's a better looking design than the current Medfield design. The only detail I have about the new reference design is it comes with a larger battery: 6.771Whr. The Z2580/XMM7160 FFRD will begin sampling in the second half of this year, with customer units shipping in the first half of next year. 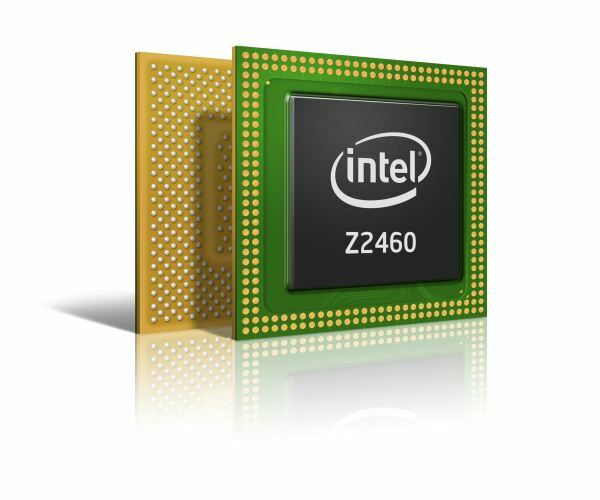 The Z2000 is Intel's new low-end Atom SoC SKU. While the Z2580 has two Atom cores, the Z2000 only has one. Max clock speed is limited to 1GHz and there is no support for Hyper Threading. Intel is planning on putting this core up against the ARM11 based SoCs that still sell into the low end of the smartphone space. The GPU remains unchanged from the Z2460 (PowerVR SGX 540) however the max clock speed is limited to 320MHz (down from 400MHz). 1080p video decode is supported but video encode is limited to 720p. The Z2000 has its own form factor reference design, which is different from both the Z2460 and Z2580. Once again I only have a single piece of information Reference designs are especially important at the low end as they can save customers quite a bit of money. With narrow margins there's not a whole lot of room to spend on industrial design or hardware customizations. A turnkey solution that's well built and reliable will be very useful for this market. On the other hand, a viable market would be an x86 version of Windows Phone 8 (hint: PowerVR SGX 544 with DirectX compatibility). I hear that metro-style apps (also winRT apps) should transcend CPU architecture. It's still unclear whether the same WinRT app build would work on both architectures without modifications or recompiling, but if it does, then it'll be perfect, and it's just exactly what .NET should have been from the first place. Huh? The Renderscript compiler compiles to byte code, similar to .Net or Java. The runtime decides what to run on GPU, what to run on CPU, etc. Very similar to CUDA. Once there is a Renderscript runtime and compiler for a platform, apps using Renderscript simply need a recompile. The Renderscript compiler takes care of optimizations at the byte code level. Its much harder, in general, to develop an app for both Android and Windows than it is to develop an Android app for different hardware architectures. One of the benefits of Android's Linux roots.